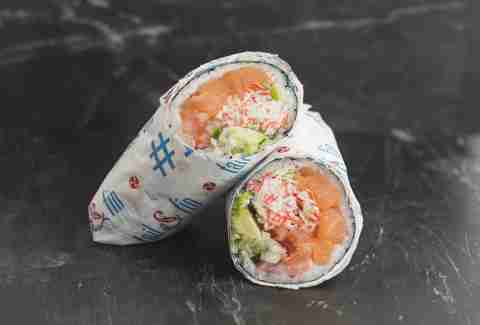 One of the biggest trends to take off in 2016: sushi burritos. Restaurants that make 'em are not only popping up at surprising rates, but in some cases, also quickly expanding with multiple locations. So what's the fuss all about? And why is Hawaiian poke already yesterday's news? We sorted out the different spots around Las Vegas that are taking advantage of the sushi burrito demand -- and looked at what they're doing to stand apart from the competition. This is the place that kickstarted the trend in Vegas, and got everyone excited about the idea that burritos aren't just for Mexican or breakfast food. The business partnership between chef John Chien Lee and Ken Aoki opened a little more than a year ago as Jaburrito on Sahara -- just west of the Strip. After a few months, Aoki set out to do his own thing, and the name changed to Soho SushiBurrito to match the branding of Chef Lee's first venture -- Soho Japanese Restaurant, which is one of our favorite spots for sushi in Vegas. Manager Vong Manoroth says the sushi burrito concept has roots in California, but felt it could be done better. "We had an idea that we could do an assembly line, where people create their own burritos," he says. "We tested the flavors, we tested the concept, and two weeks later, we came up with everything that needed to be done." 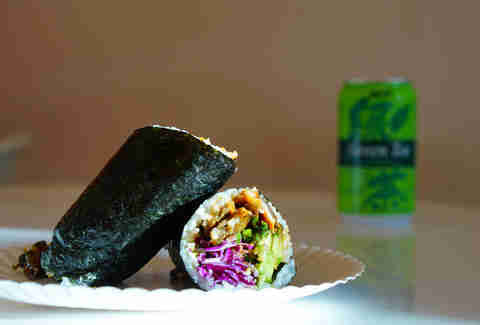 The early designs were a little too large and inconsistent, so they used a sushi roll machine to portion a square of rice that's then topped with ingredients and rolled up in a seaweed, soy, flour, or wheat wrap. 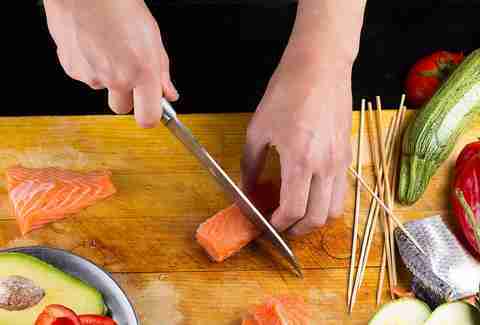 Toppings include everything from tuna, salmon, grilled steak, and a sweet omelet to a host of sauces and vegetables. If customers don't want to think about it too hard, there are some house-made creations to choose from. Manoroth says the restaurant is geared towards locals, and has the freedom to have fun and experiment without corporate oversight, citing a new steak and kimchee combo that's currently being offered as a special. Soho is already invading other parts of town. A second location, dubbed Soho Sushi Bowlrrito, opened in the southwest with the modified name to emphasize an expanded selection of poke bowls. Soho will also be found in the student union of UNLV by the end of the year, and is eyeing markets outside the state, including California, Oregon, and possibly Hawaii. "In the beginning, we didn't expect to open a lot of locations," Manoroth continues. "But then we saw it grow and how well the concept works. Now we are looking at how we can make it better and how we can open more locations. It's going to be everywhere." Located in the Silverado Ranch area of the southeast valley that isn't quite Henderson, Tail & Fin is winning loyal customers since opening over the summer -- especially folks from the nearby 24-Hour Fitness looking for some quick and clean eating post-workout. "I wish we could take credit for the sushi burrito phenomenon, but unfortunately, we can't," acknowledges owner Jeff Tomastik, who says he first heard about the concept at a San Francisco food truck. "Everybody has their own little twist on it. We have our twist by bringing a more experienced chef with a fine-dining background into the mix." He's talking about Karu Wedhas, who worked with Nobu for years, including in an executive chef position in Beijing. Tail & Fin doesn't try too hard to reinvent the wheel. 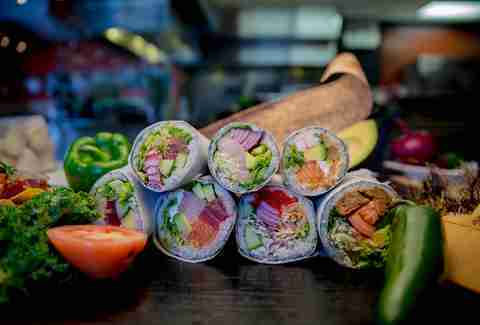 Like other sushi burrito spots, guests have the option of creating their own dish or choosing from a list of signature menu items. Tomastik says the attention to detail and how flavors work together is what makes it stand out in a suddenly crowded field. "It's fun, it's easy, it's healthy. It has a diverse level of options," he says. The restaurant's strength may be in the sauces, ranging from yuzo miso to honey sesame aioli. If you're worried about too many calories, every meal is also available as a salad. It's amazing how quickly things can change. Just a few months after Soho opened and built a buzz for sushi burritos, one of the partners took the original name and went off on his own. Jaburritos has one location in the southwest, but will soon also become the first sushi burrito restaurant on the Strip with another version opening soon at The LINQ. Owner Ken Aoki, who has more than 10 years of experience in the food and beverage industry, says he wanted to focus on food that's healthy but fast and casual. "I had a love for sushi, I had a love for Mexican food, I had a love for fast food, so this is a natural fit," says Aoki, who patterned the preparation line after places that were quick and efficient, like Subway and Chipotle. Jaburritos has nailed the fusion concept of mixing Asian and Mexican flavors -- perhaps better than any of the competitors. "I really think items like citruses, guacamole, and salsas blend well with Japanese food," Aoki continues. "A lot of the other places might have just a sushi element to them, but we really try to incorporate Mexican elements too." The Long Beach burrito, for example, combines spicy tuna, shrimp tempura, surimi crab, and eel sauce with tortilla strips and guacamole -- and the mix of flavors never feels forced. "Our cheese sauce has pico de gallo in it. Our salsa bar has half Japanese ingredients like wasabi and ginger and then the other half has jalapeños and banana peppers." Of course, those who are nervous about adventurous cuisine can always build their own creations. In addition to burritos and bowls, Jabburrito also offers tacos, salads, and nachos (or "jachos," made with a choice of corn chips or house-made taro chips) as alternatives. 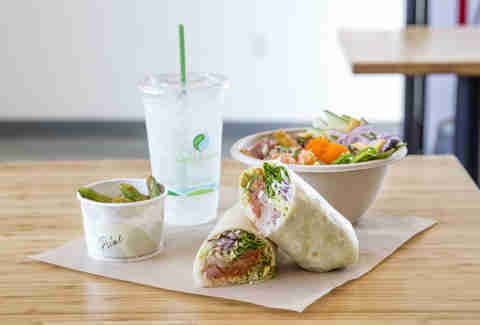 Open for just four months, Pokeman is one of the new restaurants quickly jumping on board the sushi burrito bandwagon. Chef and co-owner Andy Bessho is from California, and was inspired by what he saw happening back home. "I'm from Orange County, and I saw it there first," he says. "And it was doing so well, my partner wanted to try it in Vegas." So Bessho opened up Pokeman with Go Hoashi, who tends to handle the business side of things, and already has Izakaya Go, another dining spot in the same plaza, that specializes in Japanese tapas. The menu at Pokeman focuses on the in-house creations -- although customers are welcome to customize their meals. Bessho says he tries to work with flavors that appeal to his own tastes -- which often means spicy sauces made with Thai chili and habanero peppers. Each burrito comes in a soy paper or seaweed wrap. The best one of all may be the Eel Lover, which counts eel avocado, fried garlic, and a black pepper vinaigrette among its ingredients. "We try to carry variety and come up with unique flavors," says Bessho. So who's Ted? The name is short for Tadashi Igarashi, who has owned and operated restaurants across the country for the past 30 years. He saw what was happening with places like Jaburritos and opened up Ted's Sushi Burrito next door to his Zen Curry Express franchise on Rainbow. "He decided that the current market wants to bring a more convenient and fast style of Japanese food to the community," says general manager Thanh Lee, who adds that the restaurant tends to avoid any fusion trends in favor of traditional Asian ingredients. The most popular item at the moment is the Sashimi Oishi, made with ahi tuna, yellowtail, and salmon cut fresh every day -- and never frozen. However, there is a heavy emphasis on cooked ingredients elsewhere on the menu. "We have more cooked items than the other sushi burrito places," says Lee, who points to the barbecue eel, beef sukiyaki, and fried chicken as examples. He notes that some specialty ingredients, like pickled white gourd, aren't too common in other places either. As for Igarashi, his focus is on food as well as business. He's in the kitchen every morning, but is planning carefully for the future. "Ted is very ambitious with his idea," says Lee. "He's looking to expand nationwide over the next five years." 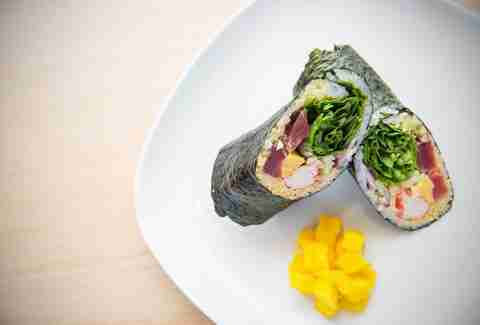 Soho may get credit for setting off the Sin City sushi burrito craze, but the owner of Sweet Poke says he came up with the idea first after hearing about it in Los Angeles. Freddy Wang says business negotiations delayed the opening of his first store in the northwest valley, but wasted no time in expanding from there. A second location in the southwest opened within three weeks of the first, and there's now another one that just opened near UNLV. A fourth is on the way in Henderson near the 215. Regardless of who came up with the concept, Sweet Poke is wasting the least amount of time possible in expanding. "I'm not surprised at all," Wang says of the sushi burrito explosion. "I knew it was going to happen like this." The entrepreneur initially got started in the sushi business, and still owns the Samurai Japanese Steakhouse in Henderson. He brought in one of his longtime executive chefs to devise the menu at Sweet Poke -- which is equally balanced between burritos and bowls with both Japanese and Hawaiian flavors. Wang says attention to detail has led to his success. "I always tell my chefs and kitchen people to use the freshest ingredients," he adds. "And if it doesn't look fresh, we throw it away." 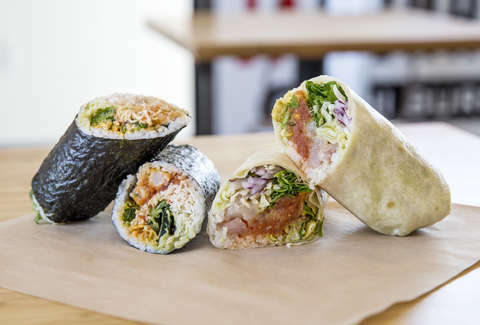 Now that he's mastered the concept of the sushi burrito at Sweet Poke, Wang says he "could do six more" locations in Las Vegas -- while taking aim at out-of-state markets like Arizona and Texas. "We're basically starting a franchise," he adds. So give him a call if you're interested. He's also planned an entirely new concept on the Strip in the near future, but is keeping quiet on details for now. It seems like this guy always has something up his sleeve, and we're looking forward to finding out what's next. Rob Kachelriess has been writing about Las Vegas for Thrillist for more than three years. He thinks anything is better inside a burrito. Except maybe beer. Follow him on Twitter @rkachelriess.